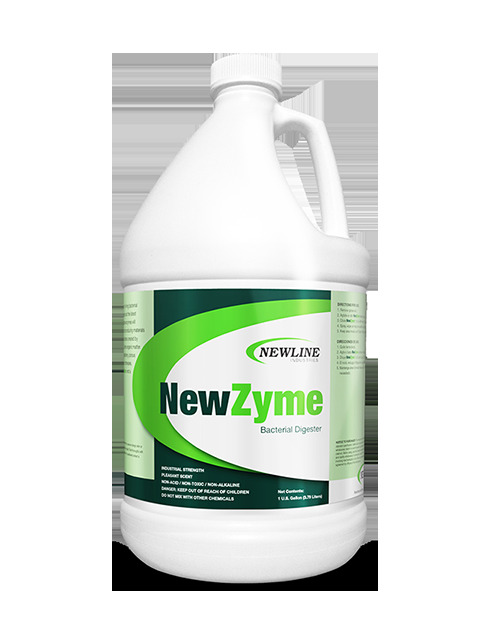 NewZyme is a modern chemical blend of living bacterial cultures, enzymes, odor control agents and the latest surfactant technology. NewZyme’s active enzymes will destroy the molecular structures of odor producing materials and stains. NewZyme removes most odors and stains created by mildew, vomit, blood, urine feces, and other organic matter. NewZyme is safe to use on carpet, upholstery, porous surfaces, painted surfaces, concrete, mattresses, linens and waste receptacles. NewZyme is not a mask…it eliminates the source! Directions for use: Remove excess soil. Shake bottle well. Dilute 32 oz. per gallon. Spray, wipe or mop solution onto surface. Apply liberally. Keep area moist until stain or odor is gone. Clean as necessary.